The universal mobile app for the packaging industry. Did you know you can bring your packages to life? You can! McNutt & Partners will bring your static images on the outside of your packages to life by delivering dynamic content such as video, images, and graphics through virtual environments. What is Your Company’s Reality? Have you ever wished that your customers could interact and engage extensively with your company’s products on retail shelves? Are you looking for a real advantage to pick up more product facings? The PackageAR team can deliver just that for your company. 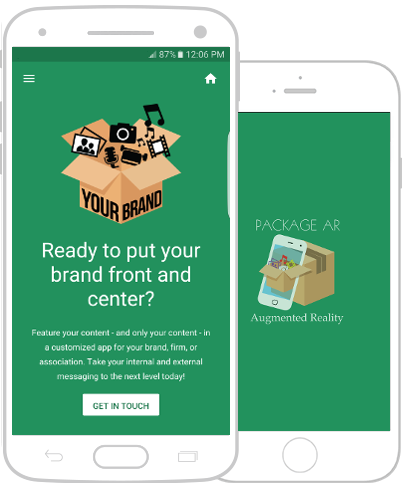 Augmented reality will engage your customers fully as they become completely engrossed in your products, as they step into a world where images come to life by launching the PackageAR app. While a picture is worth 1,000 words, a video is worth a lot more than that as augmented reality opens up a world where images come to life. For that reason and more, augmented reality is the one tool your competitors hope you don’t use. It’s time to start bringing charts, graphs, illustrations to life as you tell more of the product’s story to prospects and customers. Imagine your customers roaming shopping aisles and showrooms for viewing the augmented reality content launched through your product packaging. The possibilities are endlessly scalable and profitable. PackageAR powered by McNutt & Partners is leading the way in augmented reality. Our talented team brings great content to life through AR. We key to specific aspects of each image to enable an immediate launch of your video content or another site. We also host your images and corresponding videos to ensure that your AR content lives on through your media. AR channels allow you organize your information for ease of use. You can add a link to your website, have direct ``click-to-call`` to company contacts, or even take payments – it's up to you. Our web and app development team create next-level products that can give your company an edge over the competition. We can customize your app by incorporating elements of your existing brochures, website, and other digital content. Add your own style by customizing it with your existing media. Features such as a calculator or coupons are easy to include. We can split your content into public facing and private information and provide statistical data on app usage. We use industry leading technologies and practices to ensure your data stays yours, and your users' privacy is respected. Your information and the information on your users is kept secure. Your app can be tailored with private pages that are only accessible by your employees. 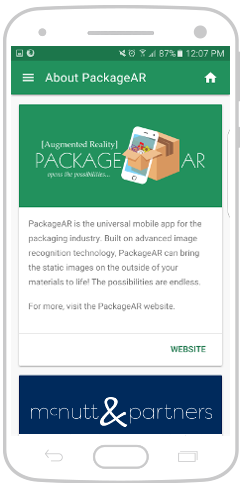 “”Package AR gives companies in the packaging industry the ability to communicate directly with customers through our products. Contact us today so that together, we can change your company’s reality by growing your business and taking it as far as it can go!